Locality: Dyke Lode, Custer, South Dakota, USA. Link to MinDat.org Location Data. Name Origin: Named as MAGnesium hagendorfite. 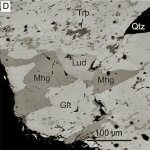 Comments: BSE image of graftonite groundmass (Gft) with microgranules of maghagendorfite (Mhg), triphylite (Trp), ludlamite (Lud), and quartz (Qtz). (CanMin, v46:635). Location: Brissago Granitic Pegmatites, Western Southern Alps, Canton Ticino, Switzerland. Scale: See Image. U=PEMaghagendorfite x rElectron Density= . barns/cc.